The new Diablo 3 community site promises news, art, and - weirdly - lots of beards. Blizzard has pulled back the curtain on its official community site for the upcoming Diablo 3; a place where fans can hang out and discuss the latest happenings in the cursed lands of New Tristam. According to Blizzard, the site will not only feature official Diablo 3 news, it will also be an outlet for the best in fan-created content as well. The first order of business on the site is - bizarrely enough - a beard-growing challenge. 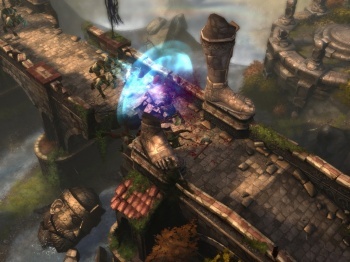 Blizzard wants Diablo 3 fans to stop shaving until the game's as-yet-unspecified release date. The beards will apparently serve as "a beacon of hope for humanity in the coming war against the Burning Hells." Don't worry if you can't grow a beard though, Blizzard isn't leaving you out. Instead, it wants to see the finest fake facial hair that those with a beard-deficiency can create. It doesn't look like there's a prize or anything like that, not unless you count internet fame when Blizzard displays its favourite entries. If you want to sign up for the Diablo 3 fan site, you can do so here. If you want to check out the beard-growing challenge, which includes pictures of the Diablo 3 development team sporting a wide range of facial hair, you can find it here.